Asar-us-Sanadid, variously translated as ‘The Remnant Signs of Ancient Heroes’, ‘Vestiges of the Past’ or ‘Traces of the Notables’, is a book on pre-1857 Delhi, its main buildings, monuments and people, written by Sayyid Ahmad Khan. Two versions of the book were published, one in 1847, and the second in 1854. A third version was perhaps in the works, but for the Uprising. Asar-us-Sanadid, today, is a canonical text, but even when it was published it was considered most impressive for its contribution to the knowledge of the history and archaeology of Delhi. The first book consisted of a substantial preface, followed by four chapters: the first chapter described the buildings outside the walled city; the second, the Fort and the structures within it; the third, the walled city of Shahjahanabad; and the fourth, Delhi and its people. The book had more than 130 illustrations, a novelty for that time. The sketches drawn by Faiz Ali Khan and Mirza Shahrukh Beg, who are both noted by Sayyid Ahmad Khan in the chapter on Delhi’s notables, are quite attractively and accurately produced. Asar-1 is also important for being among the first lithographically produced book having illustrations in India, and shows how readily Delhi craftsmen of the time took up new techniques and excelled in them. Additionally, Asar-1 contained four taqriz, or praising statements, by some of the most distinguished citizens of Delhi of the time: Nawab Ziauddin Khan of Loharu, who was himself greatly interested in the study of history and archaeology; Mufti Sadruddin Azurda, the highest ranking Indian officer in the British administration at Delhi; Mirza Asadullah Khan Ghalib, the great poet; and Maulavi Imam Bakhsh Sahbai, the Persian master at Delhi College. The second version, a vastly different book, was published merely seven years after the first. There are ‘additions and ameliorations’ mentioned by the author in the preface. The first chapter, an addition, is taken from Sayyid Ahmad’s listing of names and dates of all the rulers of Delhi from ancient times to his day, Silsilat-al-Muluk (‘Chain of Kings’, published 1852). In the appendix, Sayyid Ahmad notes down several inscriptions written on the buildings of Delhi in their original form. In Asar-2, Sayyid Ahmad makes a conscious effort towards chronological precision and in improving the general presentation by quoting in full in the margin the titles of all the books he had referred to and numbers the paragraph like a legal document. The most significant change in Asar-2 is the language of Sayyid Ahmad. Many portions of the first book are written in a highly ornate and Persianized Urdu, while the second is in a factual, and much more concise style, which came to be later recognized as the style of ‘Sir Sayyid’. CM Naim and others have suggested that much of the first was written by Sayyid Ahmad’s senior friend and collaborator on Asar-us-Sanadid—Maulvi Imam Baksh Sahbai—to whom the ornate style is attributed. Sahbai, who taught Persian at Delhi College from 1840 till his brutal death at the Yamuna near the Rajghat darwaza in 1857, had a reputation for ghostwriting. In this period, what is now called the ‘Delhi Renaissance’, Sahbai had limited himself to writing in Persian, which was a waning language. Apart from Ghalib, he had no equal in Persian prose or poetry. Sahbai was also keenly interested in the art of mu’amma or word puzzles, a genre of writing that Sayyid Ahmad was also fond of; he appreciates Sahbai’s mu’ammas by giving examples in the first book, which the translator of the book under review, unfortunately, has not included. The language of the different parts of Asar-1 would seem incongruous to discerning readers of Urdu and Persian. Sayyid Ahmad consciously uses this classical Persianate Urdu that Sahbai employs, else his senior friend’s help would have been unnecessary. At this time, as is little known, Sayyid Ahmad himself was writing ornate verses under the nom de plume Ahi, and it can be safely said that he was not averse or did not dislike this style of writing, as he later did. The passion and hard work put in by Sayyid Ahmad was extraordinary. He visited every site and took measurements of the monuments using an astrolabe, which in all probability was made at home by his maternal uncle Zainul Abedin Khan. Apart from writing portions of Asar-1, Sahbai also accompanied Sayyid Ahmad in his expeditions to the monuments outside Shahjahanabad and even stayed with him overnight, as Hali writes in Hayat-i-Jawed, his biography of Sayyid Ahmad Khan. In these expeditions, Sahbai seems to have helped the author with measurements, deciphering of inscriptions, and general fieldwork. Asar-1 came out of a combination of factors, including Sayyid Ahmad’s abiding interest in Delhi and its history, his engagement with a variety of people first in Delhi, then in Agra and Fatehpur Sikri, his exposure to writings done outside Delhi and India through these engagements, his ambition to make a name for himself, and of course his need for additional income, which as Hali informs us proved to be a failure. For the first edition the printer—Abdul Ghafur—seems to have not shared the profit, and most of the copies of the second edition were destroyed in the Uprising of 1857. However, the book brought Sayyid Ahmad the recognition that he well deserved. Within a few years of its publication, Asar-2 was translated in French by Garcin de Tassy in Paris in 1861. Three years later, the Royal Asiatic Society of Great Britain and Ireland made Sayyid Ahmad an Honorary Fellow. Asar-us-Sanadid was never translated into English—if we discount an unreliable translation of a few portions of Asar done by R Nath, which was translated from the French version of Garcin de Tassy. Unfortunately, Rana Safvi’s English translation of both the versions done from the original is a poor piece of work. 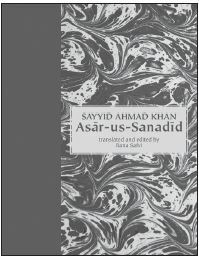 Sayyid Ahmad’s intelligence as an author that burnishes the syntax of every line of Asar and his hard work as an antiquarian is scumbled in Safvi’s translation. In translating from a language to another, the translator should have a great command over at least one of the languages and good working knowledge of the other. For Asar being written in English, at least three languages come into play, leaving out the Arabic of inscriptions on the monuments. Safvi seems to be proficient with only one of these. The book is, therefore, strained by linguistic frailty, and is unable to capture the playful, humorous and lively personal style employed by Sayyid Ahmad in Asar-1. It chokes further when the ornate language of Sahbai kicks in. In more than one instance, she is unable to find a word or phrase for the Persian and casually excuses herself citing its absence in the English language.The translation is speckled with errors of language. Going by Safvi’s preface, she seems to admit her weariness in translating Asar, as if it were a heavy boulder of a burden that she has been made to carry despite her perfunctory awareness, or perhaps unawareness of Persian. This is complemented by her tenuous grip over the subject matter completing the ingredients of a disaster. But, there is more: she also holds a butcher’s cleaver as an editor; removing several portions out of the two books. It is nothing if not an unwarranted attack on a historical text. A victim of her cleaver, in Asar-1, is the taqriz written by the Nawab of Loharu, Ziauddin Ahmad Khan, which Sayyid Ahmad had much liked. She does not translate the taqriz written in verse by Sahbai, or the one written by Azurda. Only Ghalib’s is published, which is but a travesty of a translation. Safvi’s removal of the preface of Asar-1 written by Sayyid Ahmad is confounding. A preface is an important text for understanding the motivations of the author in writing a book; the translator’s overreach in removing it is detrimental for the historical text. The preface written in Urdu for Asar-2 is not translated by her, instead she gives the English translation done probably by Arthur Austin Roberts, which had appeared in a much truncated form in the original. Similarly, she removes the list of dynasties of Delhi—the first chapter of Asar-2—citing it to be out of tune with modern scholarship. An editorial intrusion of this kind diminishes the text instead of illuminating it. Safvi fails, both as translator and editor, miserably. There is an argument that she is working towards making history accessible to ordinary readers. It is a genuine argument and a concern worthy of careful thought. Accessibility, though, should not come at the cost of historical accuracy. The alibi of ease and accessibility has imparted in her a tendency to disregard referencing and attribution: two tenets at the core of history writing. Many of her columns and her two books on Delhi regurgitate snippets from Sayyid Ahmad’s book, with little or no attribution. At best, this translation by Safvi is just one step in the direction towards bringing Sayyid Ahmad’s great text to readers in English—a lasting reminder of a brief period of his life as an antiquary. Sayyid Ahmad never wrote about Delhi, or about old buildings or cities or their citizens, past or present again after the Uprising.